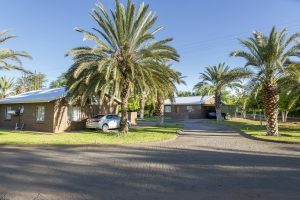 The 12 room Lodge was constructed in the early 1900’s and has since been recognised as a landmark item with its unique architectural facade protected as a prime example of the “Arts-and-Crafts style” era. 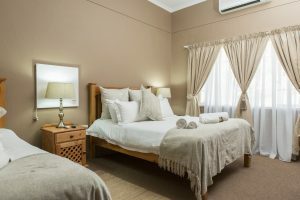 All 12 rooms of Augrabies Falls lodge are air conditioned and feature DSTV, Coffee Station, and high quality beds allowing guests a peaceful nights rest in their own private sanctuary. 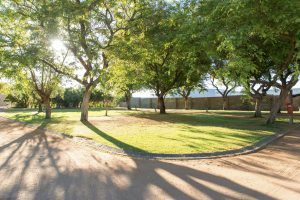 Double Story rooms have views out across the distinct vineyard country along the Orange river – lush gullies of green vineyards stretch through both the high and low country. 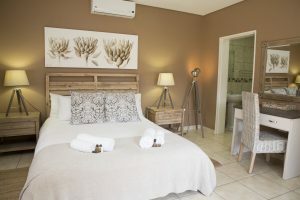 Each room features Indigenous artwork from local artists – the rich colours blending with and complimenting the more modern design and fittings. 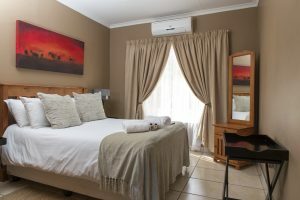 The paintings weave the modern with the traditional to create a unique blend that is Augrabies Falls Lodge.